The following is a short review on some of the known athletes currently registered for Saturday Night’s race. These athletes are listed because they have had strong performances at previous Midnight Halves and/or impressed us with their overall strength and ability through out the last year. It is very possible (if not likely) that this year’s top finishers may not be listed. Mac Schneider: The 2014 Midnight Half overall winner (1:16:00) and my favorite to win this year. Mac has a half marathon PR of 1:12:43. Mac has proven he isn’t just speed, last year his meticulous course planning, willingness to take risks, and mental strategies with his opponents all contributed to his victory. Knowing that there was a shark like NYAC’s Jerry Faulkner in the field last year only pushed Mac to become more efficient and willing to take the risks he needed to in order to get ahead. Keeping Matt Dinuson in second and Asher Fusco in third wasn’t easy either. In the 3 year history of the Midnight Half, Mac has been the best example of what kind of overall runner you need to be in order to beat this course and this field. Just some additional stats on Mac, 69th at NYC last year and 42nd at Broad St (out of 40k) in Philly. Jerry Faulkner: To say all eyes are on Jerry this year would be an understatement. At the beginning of the 2014 Midnight Half Jerry was the clear favorite to win. With his half marathon PR at 1:07:16, there are not very many people that can beat him in a closed course race. However, Jerry was left with a 16th place finish. This was largely due to his poor course preparation. Jerry had, by far, the strongest athletic ability in the field but his surprising 16th place finish left a lot of us wondering, “what happened”? This year, fueled by the need for redemption, Jerry has been out on the course practicing his plan of attack. He is definitely doing the homework to make sure this years efforts are rewarded with the overall win. Jerry may have the most to prove this year, but will he have the course knowledge and split second decision making to allow his speed to be an advantage? Pat Casterline: Pat is a very talented runner, capable of running 100+ miles a week with several thousand feet in elevation change. His very recent half marathon PR is 1:13:04. Mostly running trails Pat has spent some time on the track and the streets. He has a very high level of fitness and is capable of a podium finish on Saturday. Having not seen him in the context of the Midnight Half before, he is a bit of an underdog but fully capable of causing an upset if things go his way. Keep an eye on his performance, i am sure it will be an impressive one. Neil Grosscup: The overall winner of the 2013 Midnight Half (1:18:01). Neil was a miler at Georgetown in his college days. His half marathon PR is 1:17 at the Brooklyn Half in 2010. When Neil won the Midnight Half in 2013 he stuck to our suggested route, making very few adjustments to the course we provided in our athlete correspondence..he just ran it fast as hell. This year, with the right route, Neil could do some real damage to the line up. He has plenty of experience running through the city and knows a lot of the course ins-and-outs. 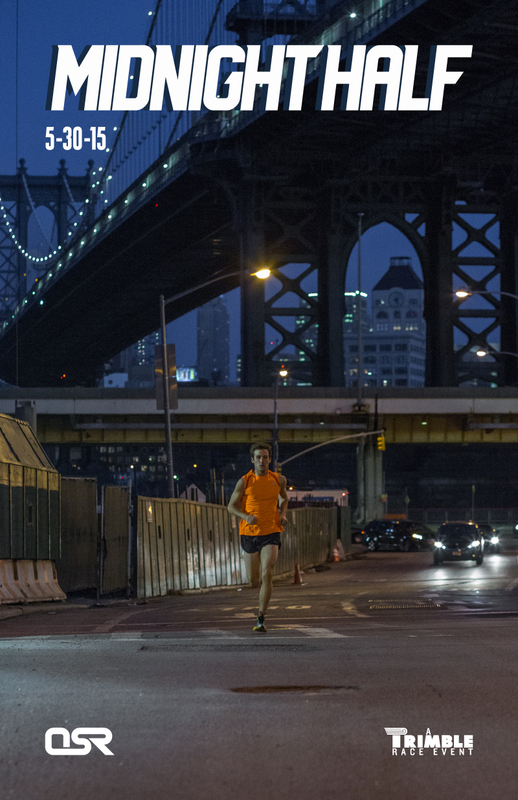 Jan Muench: I have seen him run 30mi in 3:12:18 at the OSR Manhattan Perimeter race in 2014. He averaged about 10mph for 30 miles through open city streets, it was an insanely strong performance. Jan runs upwards of 100 miles a week, not for speed, but for distance. He is the type of runner that has such a strong base and high level of endurance that if he was to plan a very efficient route, and if some others have a bad night, could come in on the podium. Although not an obvious favorite to some, I know better. Jan has had very strong half marathon performances (PR of 1:17), and is very comfortable running through traffic. Jennie Cohen: Jennie is one of the female favorites, no doubt. She is fast as hell and not afraid to compete whatsoever. Her PR for the half marathon distance is 1:25:47, achieved at the NYRR Brooklyn Half this year..not to mention she came in as fifth female at the Crit (18:21). In 2014 at the Midnight Half Jennie came in as second female finisher with a time of 1:31:28. The only female to beat her last year is not registered this year, but that doesn’t mean there isn’t someone new waiting to give her a run for her money, literally. Amy Crain: Amy is an extremely strong runner, naturally competitive, and can very obviously take the pain of running past her threshold. She has plenty of street knowledge downtown and in Brooklyn being a resident of the Lower East Side for the past several years. Amy has a half marathon PR of 1:23:07 and can definitely contend for the top 3 female positions. If her route is on point, and things go her way on race day, I wouldn’t be shocked if she came in first for women. Laura Kelly: Laura has proven consistent strength and the ability to navigate successfully through the NYC streets in the Midnight Half before coming in as 3rd place female last year with a time of 1:34:34. Her most recent PR in a half marathon is 1:31:33. If she does a good job laying out her plan of attack on Saturday you will most definitely see her walking away with some prize money. The idea was to jump out in front of a moving car on East Broadway..timed so the silhouette of the runner was engulfed by the glow emitted from the reflection of the car’s headlights bouncing off of the pavement. Feels like it was a lifetime ago. Dave and I, running around Chinatown, trying to figure out a shot that would communicate the feel of the race..the soul of what we were trying to create. Dave set up on the Manhattan Bridge pointing the camera West on East Broadway, keeping City Hall in the frame, shrinking the scale of the runner in the foreground to the size of an ant. He had a vision for the poster, I was just playing the role of the unknown runner. There are many reasons to love this shot from my point of view, most of them would be considered narcissistic, but ultimately I love this image because it is the closest visual representation of how distance running at night in this city makes me feel. The fact that its me in the shot, the fact that it was the poster to the first race I ever co-organized, are just details and coincidences. The lone distance runner, surrounded by a living city and in plain sight..yet invisible to the pedestrians on the sidewalk walking home, the taxi cab drivers waiting for the light to change..the people looking out of their apt windows at nothing. Tonight (5/6) we shot this years image for the poster. It features last year’s overall winner Mac Schneider (1:16:00). I didn’t get a chance to talk to Mac after the race last year but we got a chance to chat tonight. It was awesome to hear him recount his experiences from last year. Amazing how he prepared by studying the route weeks ahead of time, refining his approach, shaving off distance whenever he could, scaling fences and running through playgrounds. He was smart and he did the homework, even though he wasn’t the fastest in the field (he is insanely fast) he walked away with the victory. It takes so much more than speed to win this thing. Thats why I love it so much, the underdog has a fighting chance..and upsets are so much more entertaining. I cannot wait for this years race to happen, the field is already getting interesting. Most importantly Mac is back to defend his title, this is a first for the overall winner. Leigh Gerson successfully defended her title of 2013 Womens Leader with a win and a course record for females (1:26:49) last year. She is not running this year to my knowledge. Rumor has it Jerry Faulkner is coming back to give it another go. Dirk Muench is considering taking a crack at it, Dirks brother Jan Muench was the winner of the OSR 30mi Perimeter Race (3:12:18) so the gene pool has some real strength. Dirk runs marathons somewhere around the 2:30 mark. Jan is running too, so the brother vs. brother rivalry is on. Neil Grosscup, overall winner of the 2013 Midnight Half (1:18:01) is slated to run as well. What would make it interesting is if Knox Robinson, the course record holder and the overall winner of the Inaugural Midnight Half in 2012 (1:15:54), signs up this year. In 2015 the route will be tougher, the competitors will be faster and the victory will be sweeter. I hope that if you are not racing you are either planning to volunteer or planning on attending the event to cheer and support the athletes. We are organizing another amazing event, we are putting everything we have into providing the level of detail and attention that has become this race’s trademark. This year’s route will be much more difficult to navigate and will utilize as many physical obstacles as possible to create a more technical course. We are very excited to be introducing electronic chip scoring by PR Timing, an improvement we have been hoping to implement for the last couple of years. I am looking forward to the night of May 30th, I am looking forward to seeing what surprises come from this years race. Maybe some unknown runner is going to come from out of no where and crush the field like Mac did last year, or maybe Knox shows up and reclaims the title of the fastest at the Midnight Half…we will see. 2 Comments for "UPDATE: The Midnight Half – Race Report"